With our domain expertise, we offer our clients an extensive range of Iron Cure, which is formulated in tandem with the set industry standards. Its membrane curing & sealing compound, ensures to provide required curing and retain moisture in concrete along with chemical abrasion resistance coating. IRON KOT & PRIMER Chemical abrasion resistance coating natural & colored formulations. Applied with either brush or roller 2 component system Hardener & Resin. 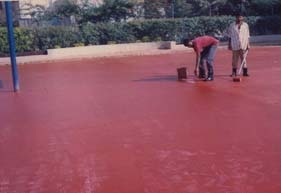 IRON CURE Membrane curing & sealing compound provides required curing retains moisture in concrete. (Additional water curing not necessary) Applied with brush or spray shake well before use.